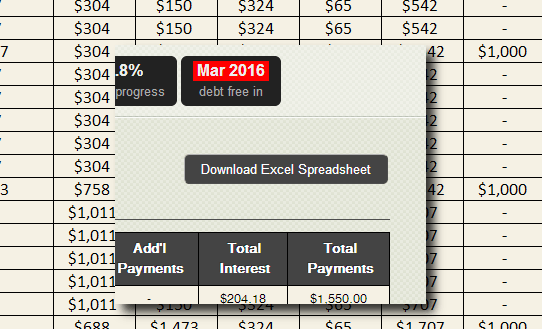 By popular demand, Undebt.it users are now able to export their current debt snowball table to an Excel file. You can download the file by going to the Snowball Table page and clicking on the “Download Excel Spreadsheet” button. If you don’t have Excel, you’re not completely out of luck. Microsoft offers a free Excel viewer here. You could also try OpenOffice, a free, full-featured open-source office suite that works just fine. I’m aslo planning on adding a PDF export as soon as possible.